This month I have some great news! No, I didn’t take the month off from work and finish my restoration project. And I didn’t save money on car insurance at Geico. What I did was purchase a new (to me) E-Type. And the more amazing news is that it runs, looks great, and is not a candidate for restoration! I make it a habit of perusing the want ads once a week to see if anything interesting shows up. I have been doing this for a number of years. In these years, I could probably count on one hand the number of E-Types listed in the Raleigh newspaper for sale. They just don’t seem to come up that often. Lately, I have been checking Craigslist.com. This is a free classified advertising website and handles all manner of things. There seems to be a large number of Jaguar sedans listed for sale on Craigslist at any given time. 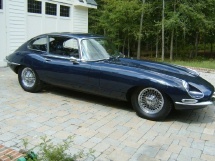 About this time last month, a 1967 E-Type 2+2 showed up for sale. This is exactly the same car that I am restoring so I had to go look. If nothing else I would take some photos that might help me put mine back together. Of course when I saw it, Jaguar lust overcame me and the next thing I knew I was hauling out the old checkbook and making the purchase. So now I have a driver. This car is a mild example of the theory that it can pay to let someone else do the restoration. I have been able to piece together the history of the car and know that it was purchased locally in Raleigh about 6 years ago as an “original” car (i.e. not in the best shape) by a gentleman who was looking for a father/son project. They did a very nice job of going through the car and getting it into excellent condition. Extensive paint and bodywork were not required so they concentrated on making the car show well, with the edition of many new interior and exterior trim parts. An extensive rebuild of the engine, brakes, suspension, and miscellaneous mechanical systems was also performed. New Dayton wire wheels and tires topped off the effort. When complete, the effort was most attractive. At this point, the car went up for sale and passed on to another local afficionado. He kept and drove the car for several years but, as he told me, he is always falling in love with something new and thus moves though a lot of cars. I was there to pick up the pieces from the failed romance. I have gone through the extensive documentation and receipts kept by both owners and can see that the selling price just barely covers their out of pocket expenses, with no compensation for the time and effort I am sure that both have invested in the car. This just goes to show that if you can swing it, it is usually in your financial favor to let another individual put in the hard effort and expense. This is a labor of love, not a profit center! Of course, no E-Type is really ever trouble free and I have developed my own list of To Do items that will need attention. My first day was spent trouble shooting the windshield wiper motor. Verdict: broken solder connection inside the motor. Next I decided to evaluate some strange wear patterns on the tires. Verdict: Alignment set to toe out rather than the more correct toe in. Now I am in the throes of rough engine performance while under acceleration. This has led me to pull the carbs off for more detailed inspection. Hey, while they’re off they would sure benefit from a trip through my bead blast cabinet. NO! Don’t go there. It’s a slippery slope, that’s for sure. In the meantime, my restoration project has taken a back seat. I have been fussing with the doors. I had taken them off and laid them to the side when I got started on the body shell work. It occurred to me that I might want to re-fit the doors on the car to establish if anything was seriously out of wack with the shape of the door openings. But of course, upon closer examination I saw suspicious bubbling in the paint along the bottom of the doors. Work with the wire wheel and the sandblaster revealed rust along the door bottom edges, which is where all the water collects that gets by the seal at the window glass. Sigh! Rust never sleeps. I consulted my body repair books and learned some interesting things about doors. Doors are skinned. There is an internal framework which establishes the basic shape and provides a mounting platform for the hinges, the latches, and the window mechanism. 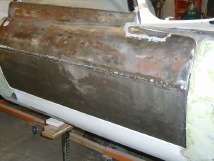 On the exterior of the framework is a “skin” of sheet metal. The skin is folded back on itself around its entire perimeter, capturing a sheet metal edge provided by the frame. 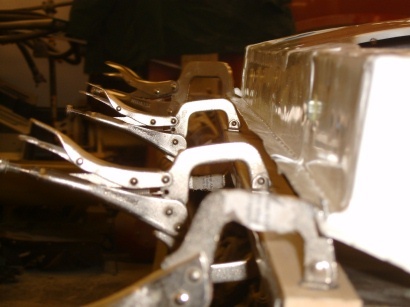 The skin is held in place predominantly by a clamping action, with just 3 or 4 spot welds to keep things from shifting around. Grind away about 1/16″ of material at the fold line around the perimeter of the door and the skin falls right off. New door skins are shown in the Martin Robey catalog. Guess what? My favorite parts supplier, Terry’s, says that they have been unavailable for months and they have no idea when they will be resupplied. So I decided on a different approach. Only the bottom edge of the skin and door frame were rusted. Several inches up things looked pretty good. Oh, did I mention the evidence of old collision damage? Maybe things looked good about 10 inches up. So I decided to cut the lower half of the door skin off and fabricate a new piece from scratch. This part of the skin is basically a rectangle with a very slight curve. Not much of a challenge after everything else I had been through. So I scribed a cut line, got out my cut off wheel, and whacked off the offending piece. The lowest part of the frame also had to go. 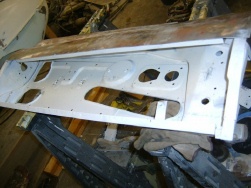 First I fabricated the repair pieces for the frame. These were generally flat sections with 90 degree bends. Most of the frame would be covered by the door skin or the interior upholstery, so impeccable workmanship was not paramount. I Mig welded the various frame pieces into place and got things ready for the skins. As I have discussed before, I prefer lap joints when matching new exterior sheet metal to the old. I rough cut the skin to shape, added a slight curve by hand, and used my “joddler” tool to put the offset flange along the top edge. At this point the skin was ready for establishing the bend lines along the remaining three sides. You want to do yourself a favor and select these bend lines carefully to preserve the straight edges of the door frame. Also, careful selection of the bend lines will effect the gap between the door edge and the door opening. These gaps should be set between 1/8″ to 3/16″. More importantly they should be uniform. I provisionally hung the door from its hinges and clamped the skin over the opening. I then applied bend lines onto the skin using a marking pen. 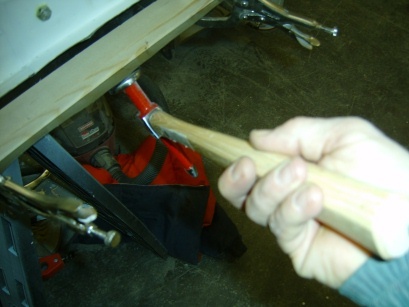 The bend line along the bottom edge of the door can be started using a sheet metal brake or by hand. It turns out my brake wouldn’t handle such a large piece so I was forced to clamp the edge between two sturdy boards and apply the first 90 degree of bend with gradual hammering. At this point, the skin must be placed on the doorframe, since completing the fold through 180 degrees effectively captures the door frame and must be done in place. The last 90 degree of bending is done gradually with a hammer and dolly. Finally, the bends on the two sides are applied. 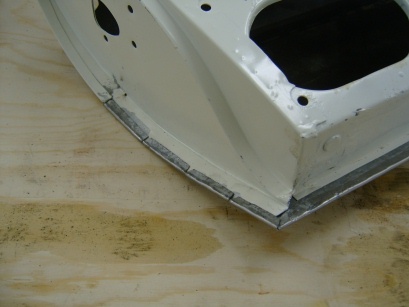 As the sheet metal is slightly curved along this edge, slits must be cut every few inches to allow for the curvature. Otherwise, the folding process is done the same with a hammer and dolly. Next fit the door onto the hinges and check its clearance to the 3 sides of the door opening. This is the last chance for small adjustments. Finally, tack weld the skin to the door frame is several places to fix it into position. Whew! It took me a page to describe it and several weekends to actually do it. What a job!